Constituents: volatile oil, bitter principle, a glucoside called menyanthin. 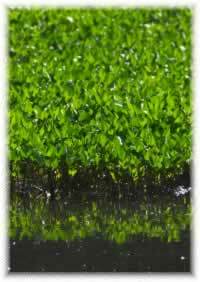 Preparation Methods & Dosage :Bogbean leaves can be taken as a tea, or used externally in a poultice to reduce swellings. It is used also as a herb tobacco. The buckbean, or bogbean grows in spongy bogs, marshes and shallow water and is one of our prettiest wild flowers. The plant was held to be of great value as a remedy against the once-dreaded scurvy, it's German name 'Scharback' is a corruption of the latin scorbutus, the old medical name for the disease. Tonic, cathartic, deobstruent and febrifuge. An extract is made from the leaves, which possesses strong tonic properties, and which renders great service in rheumatism, scurvy, and skin diseases. An infusion of 1 OZ. of the dried leaves to 1 pint of boiling water is taken in wineglassful doses, frequently repeated. It has also been recommended as an external application for dissolving glandular swellings. 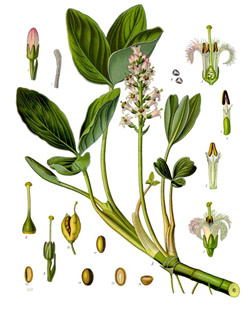 Finely powdered Buckbean leaves have been employed as a remedy for ague, being said to effect a cure when other means fail. In large doses, the powder is also purgative. It is used also as a herb tobacco. Hoffmann, David (2010-12-15). Medical Herbalism: The Science and Practice of Herbal Medicine (p. 67). Healing Arts Press.